I must admit straight up front and give credit where it is due. Me good mate Douglas pointed me in the right direction over a couple of emails. I also practised and refined the process. 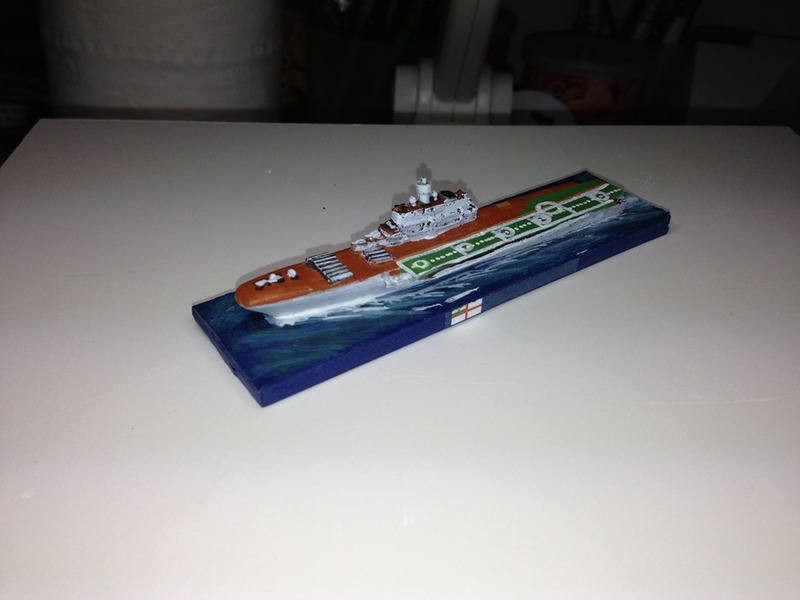 The Admiral Gorshkov up and to the left is the first attempt at marking. It used just the white marker I’ll describe below and some aggressive painting techniques. It produced a fine result and works for what may become the basis of another fleet, perhaps, in the future. The long straight white lines. These were made with a correction pen. Remember back in the dim, dark days of the past before word processors we needed to use an arcane machine called a typewriter (perhaps you are not old enough to remember typewriters – I am sure there is something in Wikipedia about them). When a typing error was made we used “liquid paper” to correct the error. In modern stationary stores you can get a correction pen for fine correction. This is like a normal pen but give it a vigorous shake first, a wee squeeze, lay a straight edge down and hey presto – dead straight white lines. You may need to run it once or twice along to get a consistent opacity but a little practice and you’ll the there. 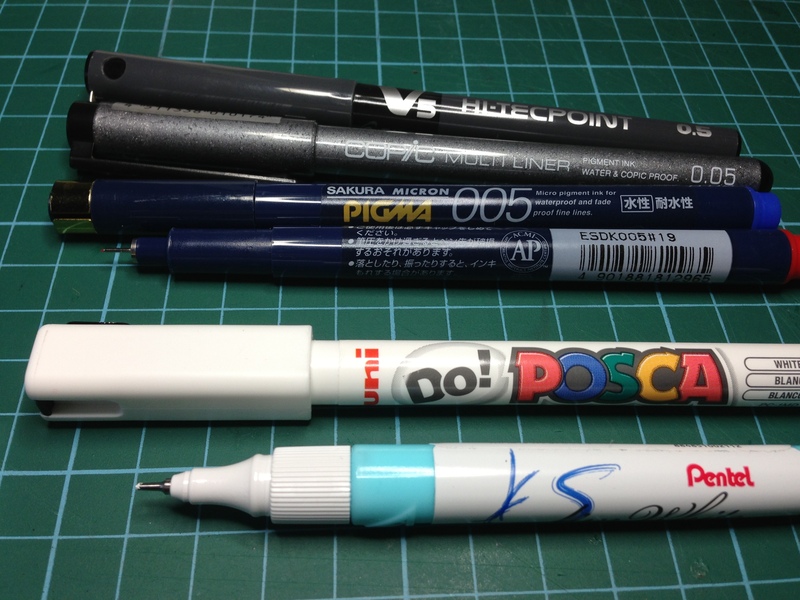 Why correction fluid – well, there is nothing special about it, it is really just another white paint. Lastly, there may be a bit of leakage under the ruler as you draw the lines – that is easy enough to touch up with the surrounding colour later (in this case the deck grey). 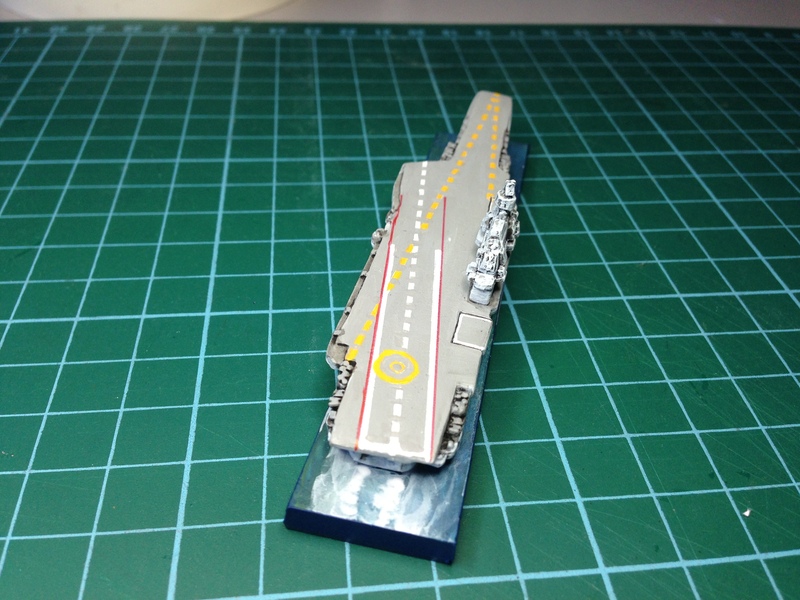 To enhance that further, I could have run a second line thickening a little and then painted out the grey sections you see on the actual vessel. The dashed white line was easy enough to do as well. Paint a long straight line with the correction pen, then with the grey deck colour, paint the grey bits out to give the dashed line. The yellow dashed line was a touch more challenging. First the line was drawn in solid white using the correction pen. I then used Games Workshop’s old Ivanden Darksun foundation colour to paint over the white. Having a straight white line there meant it was easy to paint “inside the lines”. Any paint over the edge of the white would be touched up with grey later. Next was a yellow coat over the Ivanden Darksun. Last step was to paint the breaks in with grey and touch up any paint in the wrong spot. The red lines were just a .005 red fine liner pen and a small ruler/straight edge. The helicopter landing circle was painted the same way as the yellow dashed line, just all freehand. 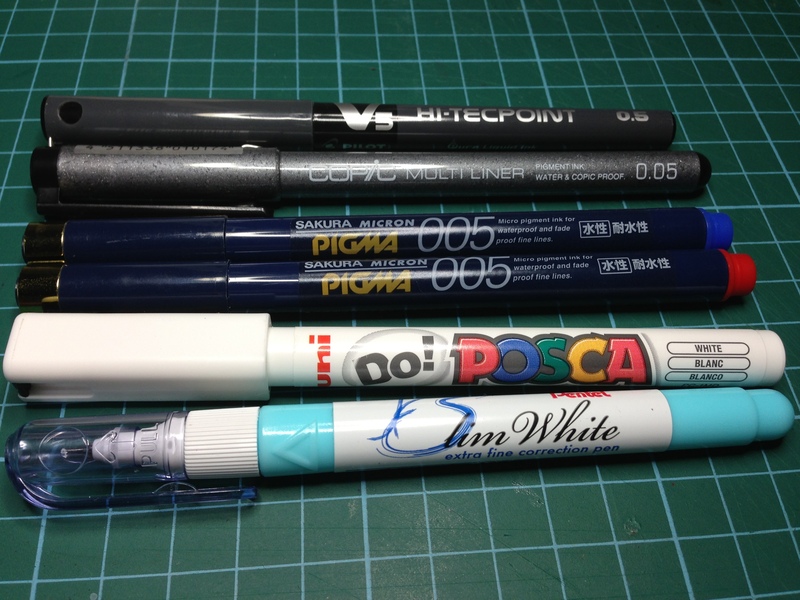 The tools were some fine liner pens as well as the correction pen. The two photographs below show the pens I used.